From the 24th to the 27th of February 2017, Pyrenese cheese master Dominique Bouchait will be presenting his distinctive regional cheeses to discerning cheese-lovers at Blue Sky Bar & Dining, Centara Grand at Central Plaza Ladprao Bangkok. 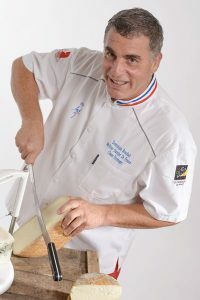 Dominique received the Meilleur Ouvrier de France award in 2011 in recognition of his 30 years of cheese-making excellence, and has since been consulting for 37 cheese-producing agricultural concerns in France. His two most popular creations are the ‘Napoleon’ and the ‘Regalis’, consumed in 25 countries across some of the most prestigious tables in the world, including those of Michelin-starred restaurants and the French president’s ‘Elysée. Dominique, along with his team, has been working on a special “Land and See” menu together with Chef Eric Berrigaud at Blue Sky Bar & Dining, which includes only top-quality ingredients in each dish such as ravioli of Napoleon – Bernard Leprince – MOF cook (THB 750++); Mignon cheese with honey, pear and rosemary (THB 650++), Potimarron soup with Régalis-Mont-Royal cheese makers (THB 350++) and many delicious options which will be served at the restaurant during February, from 18 to 22.30 hrs.